Economy voters are 28% of the electorate, the largest bloc of issue voters. They lean toward GOP candidates over Democrats, 43% to 37%. 84% of those who strongly approve of Trump think economy is getting better, versus 38% of voters overall. President Donald Trump regularly takes to Twitter to trumpet the growth in the U.S. economy, the low unemployment rate and the performance of the stock market. On the face of it, his arguments should prove persuasive to voters who care about the economy — typically the biggest bloc of issue voters. In a Morning Consult survey from Oct. 11-14, 28 percent chose this as their most important issue, above the 17 percent who said they care most about seniors’ issues and 16 percent who picked health care. Positive economic news should be a boon for Republicans. And the data does suggest they have an edge with this group: 43 percent of these voters said they would vote for a GOP candidate in a congressional election, versus 37 percent who said they’d opt for a Democratic candidate, according to the poll, which had a margin of error of 2 percentage points. The GOP’s edge widens when economy voters are asked whom they trust more on their top issue: 48 percent pick Republicans, 17 points higher than the share who go for Democrats. But academic research shows that when it comes to midterm elections, the economy’s influence on voters is more muted. Republicans hoping to strengthen their advantage with the group, and retain their majorities in the House and Senate, have also touted their passage of historic tax overhaul legislation last year, their major legislative achievement for the term, which cut taxes for individuals as well as corporations — though the overhaul has stayed largely unpopular. In their demographic makeup, voters who prioritize the economy mirror the U.S. population, though they’re slightly more likely to be men (53 percent vs 47 percent) and to be younger than voters as a whole. That data comes from a July survey that drew on responses from 3,360 such voters to provide a more detailed picture. But experts say it’s a mistake to lump economy voters into the same mold as other voters, such as those who care about seniors’ issues or health care whose priorities generally stay consistent throughout an election cycle. Vanessa Williamson, a fellow in governance studies at the Brookings Institution, said people’s concern with the economy may vary based on economic conditions, their personal financial situation, congressional policies — or the latest campaign ad. “You might imagine that partisanship would play a pretty large role” in what voters consider important, she said. If a party makes an issue a priority, she said, it will influence its supporters’ perception of what matters. 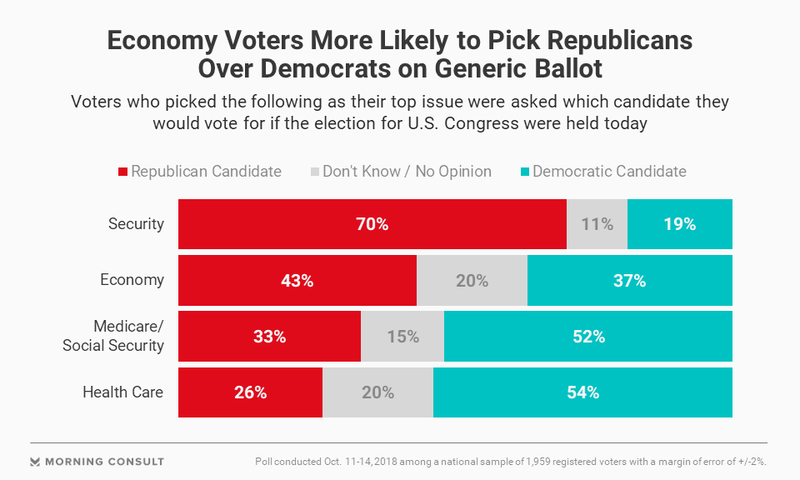 The GOP’s promotion of positive economic performance may have influenced partisan preferences: In the Oct. 11-14 Morning Consult poll, 32 percent of Republicans picked the economy as their top issue, versus 24 percent of Democrats who did so. In fact, plenty of research, including from Erikson, shows that people’s perceptions of the economy are correlated with their partisan beliefs. And the more voters approve of Trump, the more likely they are to have a positive perception of the current economy as well as future economic growth, according to that poll. In the same vein, those who plan to vote for a Democrat for Congress are more than twice as likely to believe that the economy is “staying about the same” compared to those who are voting for a Republican, 44 percent to 20 percent. 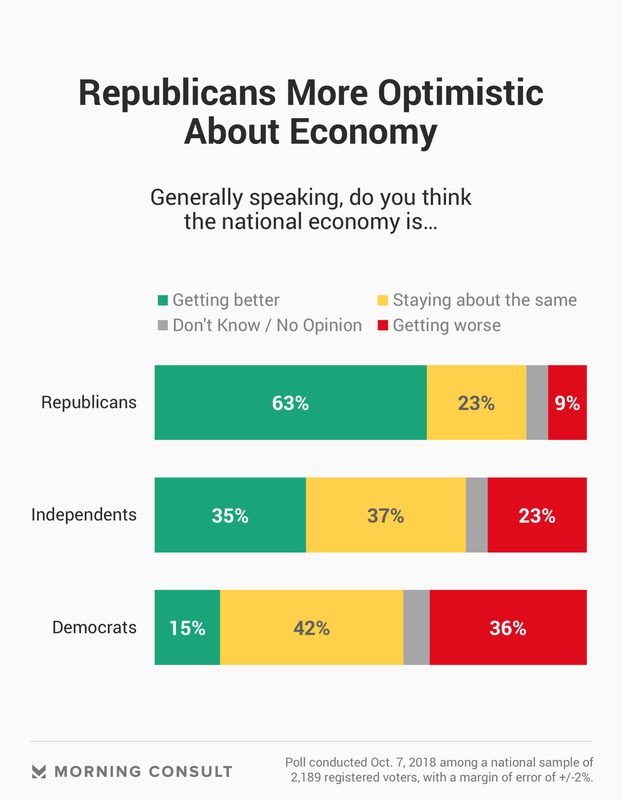 Fifteen percent of those voters say the economy is getting better, versus 72 percent of voters who would pick a Republican candidate. The partisan divide extends to people’s perceptions of their own finances. While 57 percent of Americans in the Oct. 7 poll say they’re satisfied with their own economic situation, Republicans are more likely to be satisfied than Democrats (67 percent to 48 percent). But Morning Consult polling over time shows that household income has little relationship to voters’ partisan preferences. But whatever people’s beliefs about the economy, economic conditions are not seen as a major problem — a rare phenomenon, if you look at data from Gallup going back to at least 1991. Last month, just 12 percent said economic issues were the most important problem facing the United States today, the lowest since 13 percent in May 1999. Economic performance is seen as a bellwether for presidential elections; a large body of research finds a consistent relationship between metrics like unemployment and per capita income, and who wins the U.S. presidency. But that relationship breaks down for midterm elections, and it’s not clear why. Williamson said that may have to do with the nature of the office. “It seems like Americans perceive a major part of the president’s role as being a steward of the economy,” she said. That’s not the case for other federal officeholders such as senators or representatives, who are not seen as having as much power over the economy as a whole — something lawmakers would readily agree with, she said. Instead, midterms tend to be determined by how voters view the president and his or her policies, Erikson said. Clarification: The story has been clarified to reflect what voters think about the economy based on their generic ballot choices.